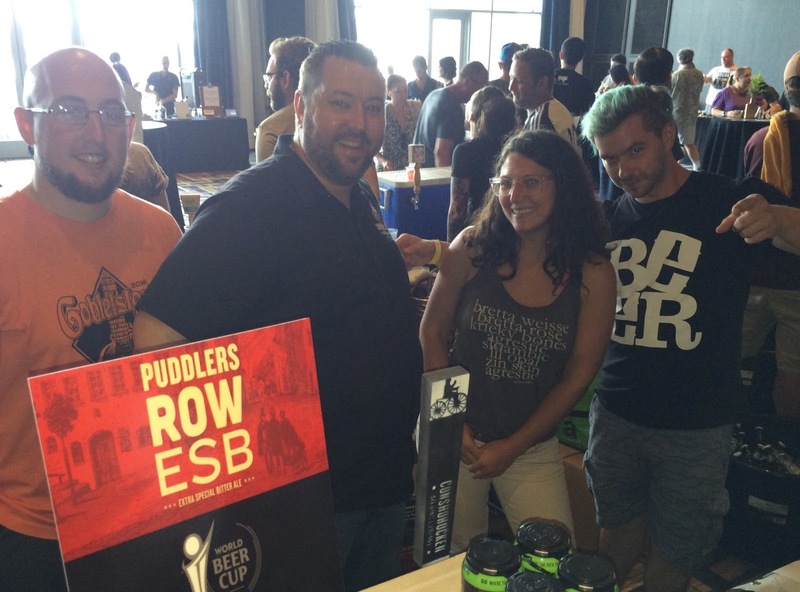 Attend a beer festival or beer pairing dinner lately? If so, you're no doubt familiar with the culinary tendency to pair beer (deservedly so, I might add) with all types of animal-related food items. If you, like me, resemble nothing of a 100% dedicated vegan lifestyle, then you have had the pleasures of beer paired with everything from beef to pork to fish and wild game to cheese, eggs, and on and on. The point of this posting, however, is not to get into the political fray around animal-friendly practices. Rather to open our eyes a bit wider on the merits of pairing beer with non-animal based food and the potential for the satisfying experience that results. Enter the Philly S.E.E.D. 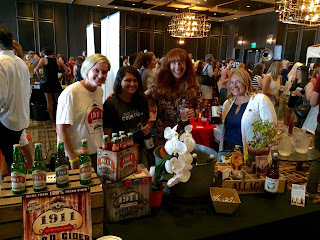 festival (Sustainable Everyday Edibles & Drinkables) that I was invited to on August 14 at the Sugarhouse Casino along Philadelphia's Delaware River waterfront. The invitation immediately piqued my curiosity because I couldn't recall hearing of such a thing in the Philly region in the past. Co-organizer Ryan Mullins-Hudak confirmed that there are "...some vegan festivals on the west coast...and one in NYC, but certainly nothing like it in the area". Not just as a curious food seeker, but also as a runner, I'm always open to new ideas for fueling my body with foods of any kind that yield optimal results. Particularly of interest to me are the ones that have positive impact on the environment, the animal kingdom, and, well, simply offer a different option than the tried and true. 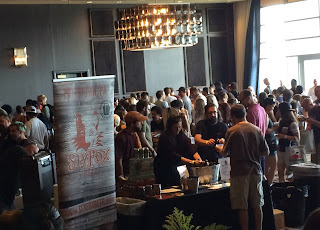 As it turned out, on an oppressively hot and humid dog day of August, inside a casino with super-charged air conditioning at a beer festival was the perfect place to be. 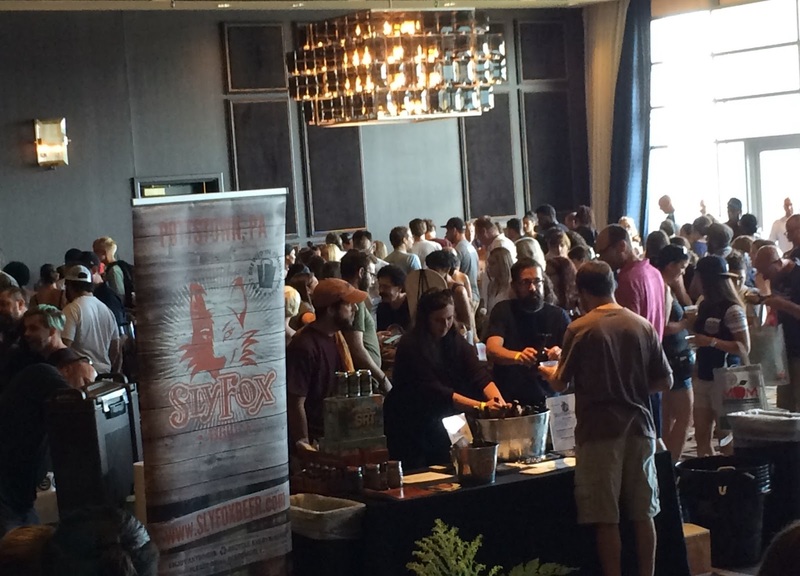 With the tasting tables and live music setup in the casino's event space far away from the gaming floor and with a sweeping view of the Delaware River and the Ben Franklin Bridge, one would be hard-pressed to remember that the festival was taking place inside a casino. The organizers had an impressive lineup of beverage options from breweries (Allagash, Broken Goblet, Conshohocken, Evil Genius, Firestone Walker, Forgotten Boardwalk, Great Lakes, Neshaminy Creek, Oskar Blues, Peak Organic, Samuel Adams, St. Benjamin, Saranac, 2nd Story, Sly Fox, Stone, and Weyerbacher), wines from Breakthru Beverage, cideries like 1911 Hard Cider, kombucha brewers like Baba's Brew, and coffee roasters. Fortunately, our winnings at the casino downstairs were enough to cover our $50 of coffee-related purchases from the Bowie, Md.-based Brewing Good Coffee Company. Great backstory, coffee, and charitable business growth plan. So much so that we passed the story along to our niece in Seattle, where they send their coffee to exactly one location. The beer, for many who have asked, is already technically vegan is it not? Well, at many breweries, yes, but not technically in certain cases. While not as prevalent a practice as it used to be, beers that are fined - or filtered - using Isinglass (aka fish guts), while not leaving animal matter behind to speak of, are not considered vegan by the most strict of those that practice. And there are beers considered maybe more experimental in nature, such as those adding roasted goat brains or rocky mountain oysters, that no doubt fall outside the vegan classification, but those are certainly more so the extreme exception rather than the rule. So in that way, the S.E.E.D. festival to me was more about the creative food items being served (and finding beers to pair them with) rather than learning about a "vegan beer". This concept seemed to work well and the event appeared (judging from comments both overheard and directed to me) to be attended by a rather balanced amount of both strict vegans and non-vegans. 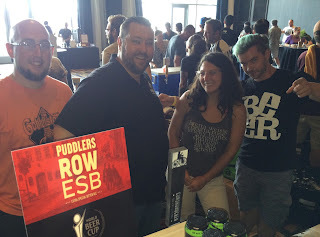 It would seem to work better next year, however, to guide the attendees into suggested pairings where the food and beverage tables are positioned next to each other similar to the proven Brewer's Plate approach. In the first year of this festival, while laid out comfortably in the event space in addition to an outdoor patio overlooking the river, it was up to the attendees to hopscotch between beverage and food vendors to find the best pairings. I'm looking forward to even more pairing selections as they promise to learn from mistakes this year and grow larger and better next year. I was able to find a handful of pairings that were satisfyingly flavorful and, served at a party, would not leave you hungry. Suzy Woods from Allagash was pouring the new year-round cage-and-cork bottled Sixteen Counties (the name refers to the brewery's ingredient sourcing practices from farms around the sixteen counties of Maine) and the herbaceous and hop-forward nature of the beer paired nicely with cups of curry from Shankara Vegan Restaurant. The Mushroom Crostini with Rosemary Lemon Cashew Cream also did well with the Allagash beer. Over by the St. Benjamin table, the brewery's kitchen was serving up chips and salsa that complemented the easy-drinking Bayside Saison. They also brought a personal favorite, the Foul Weather Jack English Mild, whose light roasty malt notes went beautifully with Soy Cafe's potato-based mac 'n' cheese. Desserts were not to be left out of the vegan options either. In this case, I was able to track down a chocolate and salted pistachio cookie from Love Chunk which went quite nicely with Broken Goblet's Yin Yang Oatmeal Stout. This was inexcusably my first taste of Broken Goblet's beers, which somehow have escaped me (and a visit to the Bristol location) since they opened nearly two years ago. Going out a winner in more ways than one, Patty and I won $52 on the slot machines after the festival, had a credit for free food (we chose Taconelli's storied pizza, which I was surprised to learn had a spot inside the casino), and parked for free. What a day!